Thanks to all the people who emailed about the blogging course. We'll start the first course in late June. I'm particularly looking forward to the Skype sessions. I'm sure it will be a lot of fun. If you want to join in, please check the previous post and email me. You are not the only daggy one, Rhonda. LOL! I just realised when I read your post that it is Friday. Another week gone already. I am rendering lard at the moment so had better go and check on it. Have a lovely weekend. Daggy or not, it's time to layer up in clothing. As I'm writing this, it is a cool 1 deg C here in Ballarat. The sun is shining, another words, even colder, but that means layering with add ons such as boots, scarves, hats and coats. I love the comfort and warmth these clothes give me. Right now though I'm preparing to check out your weekend reading before venturing outdoors. Have a great weekend Rhonda. Your Caramel Custard looks wonderful! By any chance is the recipe here on the blog anywhere? And if not, would you mind sharing it here? Hi Sue, yes, we need comfort, that is for sure. The cistard is just my ordinary baked custard, the recipe is on the blog. The caramel is brown sugar, with a little butter, melted in a pot and poured over the custard. I'll jump on the daggy train. On the couch last night in my thermals, flannel pj's, two pairs of socks with a crochet blanket over my legs. Best part was sharing the blanket with my daughter. Really looking forward to the course. Hope you have a wonderful weekend doing the things you love too. I love custard, but I've not been successful in making it. My sister, however, makes the best custard pie and shares with me! Thanks for some great links Rhonda! I hope you have a lovely weekend. i cannot believe you did not put the custard recipe on the blog. i am devastated!!!!!! 1. Place eggs, sugar and vanilla in a bowl and beat together with a hand mixer or whisk. 2. Heat the milk so it's hot but not boiling. 3. Pour the milk into the egg mixture, and beat again until thoroughly combined. 4. Pour the mixture into a loaf pan and put into bain marie. Fill bain marie with boiling water so it comes half way up the side of the loaf pan. (This allows the eggs to cook gently, which is essential.) Sprinkle on the nutmeg. 5. Bake in a preheated oven at 160C for 45 minutes. 6. It needs to be wobbly when it comes out of the oven. 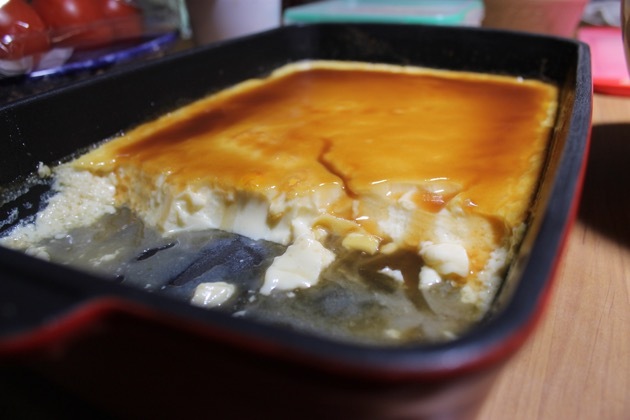 You may think the custard is too thin and isn't properly cooked but don't be tempted to continue cooking past 45 minutes; it will continue cooking after you remove it from the oven. Thanks for the Charles Dowding link - his gardens are dreamy! I, too, am a blogger and was amused to find that you started your blog one week and one day before I did, also ten years ago! A woman from New Zealand who reads you directed me here to find the link about Nancy Luce as I also write about chickens. What a charming article! And this is how blogging works, isn't it? We find people with whom we share so many things all across the world and what a beautiful thing that is. And now I have found you!